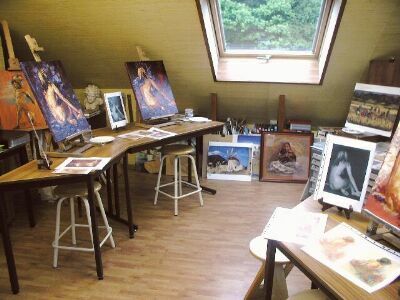 The workshop was set up in 1996 to provide courses on drawing, pastels or oil on canvas for small groups of adults. Lectures and demonstrations are illustrated with works by current artists, from France as well as other countries, so that each pupil, once he has a basic knowledge of painting techniques, can develop his own style to express his personality and feelings. Cassettes, slides and books are used as background material for the lectures, ensuring that pupils are not too strongly influenced by the particular style of the teacher. The pictures are painted or drawn from life or taken from the artist's own documents, depending on the nature of the work and the theme set. The subjects are varied - landscapes, portraits, flowers, still life, animals - depending on the group's interests, gradually incorporating more advanced techniques. Reflections, transparency, against the light, etc. are fascinating subjects for study. The aim of these works is to help to fire the imagination and develop personal artistic creativity.